Our template (below). We used the largest wreath shape. Print our template directly onto card and cut out, removing the centre carefully. 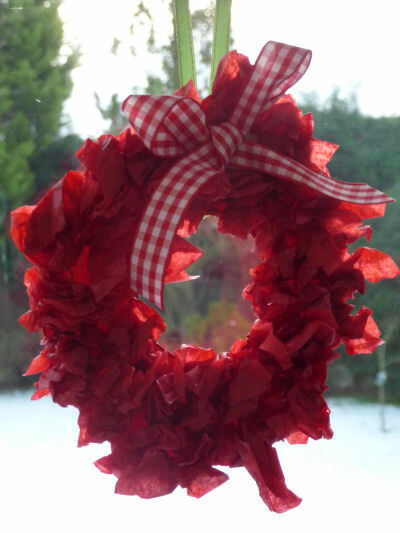 We used red printer card to match our tissue paper, but it isn't necessary as long as you cover the wreath closely. Alternatively, print onto paper and use as a template to cut out some heavier card as a base. Punch a hole in the template where marked. 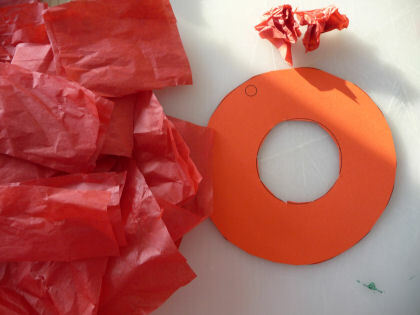 Rip or cut the tissue paper into small squares (you might want to do this in advance for the youngest children). Our squares were about 3 inches or so. 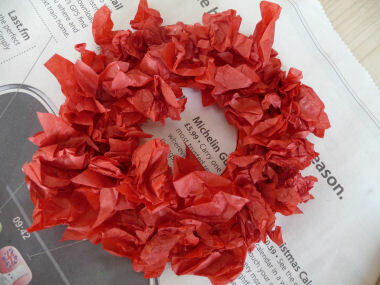 Cover the wreath shape with a good layer of white glue, then scrumple the tissue paper squares up and push them firmly into the glue. If you prefer you can pour some glue into a small container and the child can dip each scrumple into the glue, then stick it onto the shape. When completely dry, decorate as you like. You could add blobs of glitter glue, press in some beads or sequins, or even give a light covering with spray glue and then shake over some ultra fine glitter. 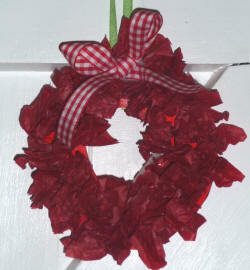 We just added a gingham ribbon!